Our fur vests are only made of artificial fur, supplemented by artificial leather. No animals were hurt in the making of these vests. Why you should buy our fur vest? Our fur vests are only made of artificial fur, supplemented by artificial leather. So, if you are an animal lover just like us, you can wear our fur vest without any animal being killed because of your piece of clothing. Although all our fur vests are artificial, they are one of the highest quality, because they are made of soft fur and therefore are equal to the right ones with the quality. As the vests are supplemented by the artificial leather, even in cold winter days, you will not be cold. In addition, all vests have invisible fastening and you can choose from 3 lengths and many colors. So if you are the right fashion maniacs, our fur vest would certainly not miss one of your outfits! A splendidly shaggy faux-fur vest gets rich, natural-looking depth in a multitude of colors. Lovely vests at a great price would definitely recommend. Very quick arrived, good quality. Thanks. The vest I bought was a perfect fit and arrived on time. Would definitely recommend! This company is excellent. Very helpful and friendly. I would recommend this company to anyone. 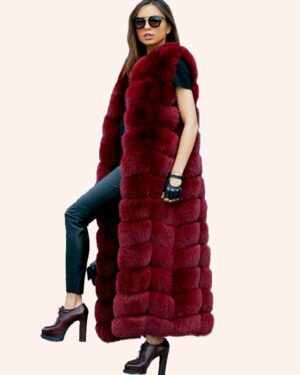 Wonderful item, this long fur vest is absolutely beautiful, I receive all kinds of compliments from people wherever I go. Great vest! I also had question about my order and got response back in an hour! I highly recommend. I only ordered once at Myfurvest and I am very satisfied. My order came very quickly and the item corresponds to the photos. The customer service is also very good, they respond quickly to all your questions. They answered my question very fast and actually helped me. So I would recommend this site. I’m still waiting for my product to arrive tho. But I can’t wait to receive my order! Really nice furs and excellent customer service. The shipping was fast and the response from customer service was prompt. Plus, the quality of vest I received was just as what was seen in the pictures on the site. I would definitely recommend. Great customer service! Very attentive and helpful with my purchase questions! No complaints.